This is the story behind my Guinness World Record™ for the Furthest champagne cork spit. Sure, anyone can spit, but some enjoy spitting more than others. I'm one of the latter. I wasn't satisfied with my previous cork-spitting success, because a breeze had affected the distance I was able to spit the projectile. So this time I made sure no wind got in the way; my assistants and I were alongside a 6-metre high wall. My regular assistant was a pleasure to have there – he knows exactly what to do when, making my work easier. On this occasion, I had a wild-natured eccentric older woman helping too. The 3 of us joyfully set to work, which began with my making sure we all read and understood the rules I was to follow. As per the instructions, I stood behind a line and began spitting, aiming my champagne cork at a pit of sand some distance ahead of my nose. This was the part that made my lungs burn. By thinking about precisely how to increase my spitting distance, I came up with various tactics. They worked, obviously, but they had side-effects too! For each attempt, I drew in and held as much air as I possibly could until my lungs stung in my chest. I pulled my tongue as far back as I could after smothering the cork in saliva, and cocked my head back until I could feel my neck vertebrae grinding on cartilage. Not a nice feeling. I sucked on the cork, much as a baby draws a dummy into their mouth to get it into place, and in doing so, inevitably drank a collection of whatever was sticking to it. Most of it was sand from the pit ahead, but who knows what else I was ingesting – I'd had the pleasure of seeing a number of locals clearing their throats and spitting out the phlegm as they walked, there was a large and well-used commercial rubbish bin next to where my assistants and I were, and trucks used the lane as an access way to deliver goods to the nearby shopping centre. I could easily have swallowed tyre rubber, viruses from the throats of others, decaying insects, tiny pieces of plastic and more. But I really did not care because I was determined to spit my cork into the record books. So I spat, spat and spat, all the while thinking of what I was putting into my stomach. My thoughts drifted to how wildlife must feel eating all the rubbish us humans leave lying everywhere we go: glass, polystyrene, aluminium, paper and other litter that's not good for wildlife to get into their systems. That considered, I wasn't worried about eating my share! A supermarket delivery truck rolled up the narrow alleyway, forcing us all to step aside for a moment – the driver, I am sure, had no clue what would-be-famous cork spit was about to take place right there. 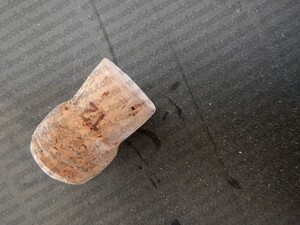 One of my efforts produced a fairly good result and the cork smashed into the sand at an impressive distance. Hastily, I got my accomplices to measure and record all necessary detail, secretly panicking in case the cork or the sand somehow moved and nullified my efforts. Within minutes, we'd completed things and were on our way. I wasn't sure about the other 2, but for me, seeing the distance I was capable of spitting had produced a fizzy feeling of accomplishment in my chest; like that fizz one gets when opening a bottle of champagne. I liked it, and this reconfirmed to me that I'm good at playing with corks. When I got the official certificate, I was elated and could hardly sit still in my chair. It was a wonderful feeling.